Yesterday I made the 13 hour odyssey by bus from Inverness back to London, and this little baby kept me entertained the whole way home. Apart from when I was talking to the Polish guy next to me who apparently got as far as the boot camp on the X Factor. Really nice chap. We had a bit of a 1980s medley singalong as our brains started to crack on the final approach to London, and I'm eating the last piece of his carrot cake as I type this. He thinks he's probably going to be on telly this Saturday. Keep an eye out for the Eastern European who looks a bit like a young Vladimir Putin. And, of course, we spent much time gossiping about the incredibly rude driver who kept shouting at people every time they didn't do what he hadn't told them to. Back to the book, though, which I bought in Leakey's Second Hand Bookshop (& Café), an Inverness attraction recommended to me by both my friend Simon Varwell, and the couple who run St Ann's House B&B (which I really can't recommend highly enough - they are bendoverbackwardly welcoming and helpful). First published in 1964, the back cover promises to take "the next step forward in expanding the SF short story from the limitations it has suffered during the last thirty years"; limitations which presumably include rampant sexism and the clumsy positioning of technical jargon into flowery prose. That and just plain bad writing. 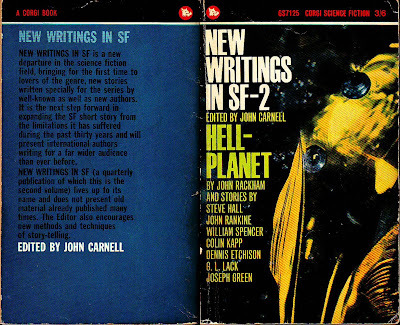 The first story, 'Hell Planet' by John Rackham, is about what might happen if aliens intent on reopening previously-dangerous trade routes discover "simian hominids" living on Earth. This is one of the better-written (and the longest) pieces, featuring three high-status scientists who are along for the ride, which annoys the ship's captain, who feels they'll only get in the way. "Didn't he already have troubles enough, that he had to be stuck with, one, a high-power, free-thinking status-one cosmologist and savant, two, a low power status-one ethnologist-anthropologist, female, and, three, a senior status-two technology expert." "All three listened intently and this was something else he had noticed, the way they listened with complete attention, their emotions almost totally suspended. He directed his explanation to Caralen, finding her most in need of it." I won't spoil the ending, lest you should want to read it yourself, but suffice to say that she follows the man she loves into certain danger, still not having made any significant contribution to the story. Only a potential to do so in the future. The best prose, though, came in the next story, 'The Night-Flame' by Colin Kapp. Well, I say 'best'. I did enjoy reading it more than the other stories, but not for the intended reasons. Faisal Balchic investigates a strange beam of radiation in the valley near his house. Soon he discovers that the English (yes, English) military has been fighting a war in secret against an all-powerful enemy. "One big gas-laser satellite could burn life from the face of Europe in a single orbit, yet stop selectively at certain national boundaries. And remember, no radio-activity, no dangerous fallout, nothing to occupy but a nice sterilised charnel-house. Genocide? Hell, we need a few new words in the dictionary of humanity!" "The major was sure that his back had been scorched by the leaping sheets of electrical energy which speared like crazy, living lace from the projector out to the instrument racks. Blindly he cut on, knowing that only God and the transience of an ionized air gap at such energies would determine whether he lived or died." "God! How I hate this filthy war! Have you ever thought how those poor devils in the satellites must feel when our beam locks onto them? Both sides exploiting fundamental weaknesses in the other's physiology: they know that flesh must burn, and we, that sphingomyelin and similar lipoids in the nervous system must react when stimulated by certain types of r.f. radiation." It was almost like I was there.